It’s clear there is a diversity and inclusion problem in tech. What some companies still struggle with, however, is how to fix it. Part of that is because it can be a hard problem to solve if one doesn’t scratch the surface of understanding it. Nearly four years since tech companies who previously sued to hide their diversity data released it, “we’ve had basically no progress,” Freada Kapor Klein of the Kapor Center for Social Impact said on a press call today. In comparison to what Hollywood is doing to tackle issues of harassment and discrimination, Kapor Klein says she feels embarrassed as a member of the tech community. “Why did Hollywood approach these issues as a concerted effort by the sector and tech has yet to do so,” she posited on the call. That’s where the Kapor Center for Social Impact’s Leaky Tech Pipeline comes in. With The Leaky Tech Pipeline, companies, founders, investors and other leaders in tech can explore the complex framework of diversity and inclusion at play. This framework consists of a mix of systemic racism and discrimination, the racial wealth gap, the digital divide, access to opportunity and much more. The Leaky Tech Pipeline is designed to help companies strategically tackle diversity and inclusion initiatives. Both the report and website aim to function as a resource for stakeholders at schools, tech companies and VC firms to explore the data and research on some barriers to diversity and inclusion. The idea is to help people avoid being part of the problem and instead be part of the solution. “There is an elaborate series of biases, often unintended, that begin actually at pre-K and go all the way through the education system,” Kapor Klein said. These biases then make their way into teacher expectations, lack of role models and the lack of computer science education, she said. Outlined in The Leaky Tech Pipeline are four key stages of the pipeline: Pre K-12 education, higher education, the tech workforce and entrepreneurship and venture capital. On the website, these four topics are laid out with clear-cut statistics and graphs to help the reader understand the trajectory. In Pre K-12 education, for example, only 19 percent of black students are proficient in 4th grade math, compared to 62 percent of Asian students, according to the U.S. Department of Education’s 2015 National Assessment of Educational Progress. Meanwhile, white students participate in Advanced Placement math and STEM courses at 5x the rate of Latinx students and 9x the rate of black students. These racial disparities come from structural barriers and the digital divide, which is the lack of access to technology and internet at home, according to the report. Black and Latinx families are unfortunately less likely than white families to have access to broadband Wi-Fi in their homes, according to the Pew Research Center. In higher education, black and Latinx students make up just 20 percent of all computer science Bachelor’s degree earners, according to the National Science Foundation. What causes these disparities, The Leaky Tech Pipeline explains, are social, economic and psychological barriers at play. For example, the generational wealth gap affects which schools students attend and their ability to finance their education. Within the tech workforce itself, which is predominantly white and male, the recruitment and interview processes, workplace culture, biases and harassment all contribute to an overall lack of diversity. Last, but not least, the report looks at entrepreneurship and venture capital. Of all the venture-backed companies, only 1 percent of them are founded by a black person, according to a 2010 CB Insights survey. Meanwhile, only 2 percent of investment team members at VC firms identify as black and just 1 percent identify as Latinx, according to the National Venture Capital Association. 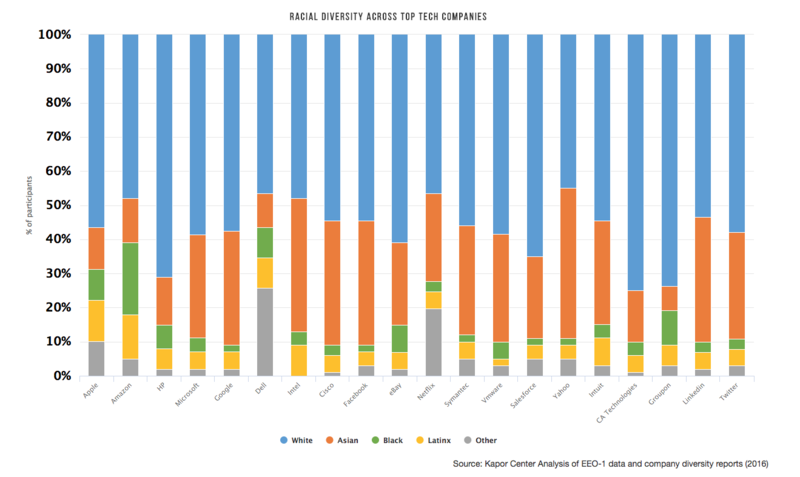 Racial disparities in financial and social capital, according to the Kapor Center for Social Impact, limit opportunities for founders of color to start and fund new companies. 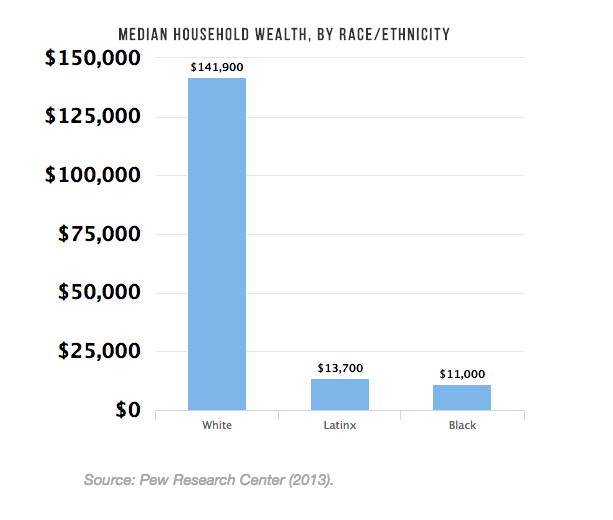 White families, for example, are 5x more likely to receive financial gifts and inheritances than Latinx and black families, according to the report. The purpose of the report is to make clear the complexities of the lack of diversity in tech problem. As a starting point for companies and other stakeholders, the Kapor Center for Social Impact recommends increasing equity in K-12 education, expanding computer science education, enhancing pathways to careers in tech, implementing diversity and inclusion strategies, increasing prevalence and access to tech role models and creating public-private partnerships to develop the tech workforce of the future.